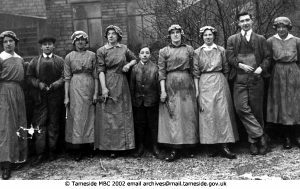 This final Blog on Ashton-under-Lyne and the Great War is a tribute to all those that lost their lives; but it is also a tribute to all the families that lost their loved ones. The tragedy of death on the battlefield is without doubt a horror that none of us would ever want to be part of. But the truth is, when the soldiers returned from the insanity of trench warfare and told their stories; the veil of propaganda, of glory and brave men fighting for their country is removed. The truth of trench warfare laid bare and the families then knew; of the horrors their loved ones suffered prior to their deaths. Knowing this can only have hurt them to the very core of their souls. How would any of us now deal with the fact that our fathers, sons, brothers, uncles and cousins; climbed ladders from a trench to be mown by automatic weapon fire. Where literally thousands of men were killed in hours, their bodies littering the mud of foreign fields. The families that went through this can only be respected for their own bravery, their courage being the fact that despite their loss they carried on. Women raising children alone and children growing up without father’s; those children baring witness to the pain of their surviving parent’s grief. 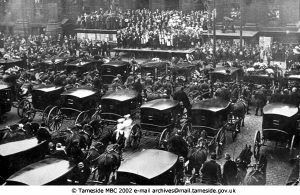 Imagine this in the streets of terraces here in Ashton-under-Lyne, where every family lives with the same loss, tragedy on a grand scale. My sincere hope with this piece of writing, is to inspire young people to look back at their own family history. 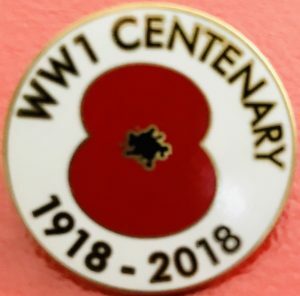 Don’t treat World War One as a piece of political history, it was without doubt one of the biggest tragedies of the 20th Century; full of personal stories of bravery and loss and this applies to both sides. No matter which side you fought for in this war, soldiers were inspired to fight in it by ideals of truth and justice. Many were volunteers who were drawn by the speeches of their leaders and not only national leaders; people from their own communities rousing them with speeches at public meetings. Many who went to war were only teenagers, barely out of childhood; but willing to lay down their lives for their towns and nations. In recent times here in Ashton-under-Lyne and nationally we have heard a voice from some condemning the remembrance of the brave souls that lost their lives. Their reason for this is the claim that remembrance and the red poppy is a symbol that glorifies war. This could not be further from the truth, Armistice Day does not glorify war as such, it is a passionate and heartfelt consideration of the loss suffered by many countries. If you look at the War Memorial here in Ashton-under-Lyne and across the UK they appear as a glorious monument; with angels carved in stone looking on at the rows of names of the fallen. These are the trappings of our history as a Christian Nation, the glory being the peoples view of the glory of god; and the fact that nearly all believed that their loved ones had transcended to Heaven and a better place. For the people of Ashton-under-Lyne or for every nation that fought in the conflict; it is not time to rewrite history. The people in the world that would want war are very few, the majority would never wish for another war ever. But for lessons to be learnt about conflicts on this scale, it cannot be right to condemn those that want to remember their family’s loss. There are very few alive today who will remember the Great War, but their experiences of what that war really meant should never be lost. Because if it is, the lessons learnt will be lost with them, the political meanings of this war and how it started would be irrelevant in the modern era. The assassination of a European Prince would cause conflicts between nation states; but it would not mobilise blocks of countries to invade one another or cause a nation to officially declare war on other nations. On Sunday 11th November Ashton-under-Lyne, Tameside and the rest of the United Kingdom will remember the fallen by laying Wreaths and wearing poppies. But this isn’t an event unique to the UK and if you look beyond our borders you can remember those from other nations that died. Remember that the First World War killed over 16 million people in just four years. Over 10 million military personnel and nearly 6 million civilians lost their lives. Not all who died in this conflict were killed by gunfire, bombs, gas or missiles; millions died of starvation because their nation’s resources were ploughed into fighting a war. Food that could have prevented many deaths went to the frontline and to the soldiers of many nations. For instance, in Serbia alone they lost 29% of the total population of the country, at total of 1,200,000 people. In terms of military deaths their nation lost 265,164 soldiers from a total of 400,000 fighting men they started with in 1914. The awful truth is almost one million Serbians who died in only four years were civilians. The terrible truth of the First World War for this Nation was the price they paid for a single act of violence. In percentages the Serbian people were devastated by the conflict, the population of Serbia in 1914 numbered 4.4 million people, by the end of the war that was reduced to less than 3.2 million. Worst still was the fact that 60% of the male population of Serbia lost their lives in a moment of history. 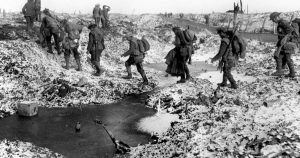 Consider the fact that four years is the time between World Cup competitions or the Olympic Games, for many on those terrible battlefields a century ago. Those days and years must have felt like an eternity, a nightmare of horror and pain that would be never forgotten till the day they died. Next time you dismiss the Red Poppy, consider what the soldiers and their families bore in paving the way for a better world. They aren’t just a passage in history, if you look in the faces of your parents and grandparents; you will see their likeness. The fallen soldiers are only part of what we remember on November 11th , when you see your surname on a War Memorial, look past the Glory you perceive to be there; and see the pain and torment that was the First World War. See your Great Grandmother weeping at the loss of her husband, son or brother, there is no glory in her tears; only grief and torment tinged with pride that her men fought for what they believed in. We should stand together this year and remember the fallen from every country; whether soldier or civilian their loss should never be forgotten. 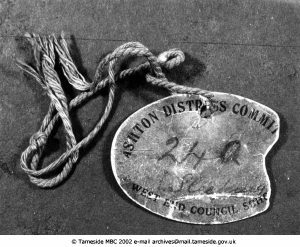 From here in Ashton-under-Lyne to the wider world, our shared history whether good or bad should be remembered so we never stop learning from our mistakes. To forget would be unforgivable, the glory we should seek is that moment in time when the human race remembers the past without using it as a reason for more conflict. When you stand with pride as the Last Post sounds. This entry was written by Stetat, posted on November 1, 2018 at 10:39 am, filed under Ashton under Lyne. Bookmark the permalink. Follow any comments here with the RSS feed for this post. Post a comment or leave a trackback: Trackback URL. I’ve just returned to Tatra-Rotalac. Can you tell me if we have a credit account with yourselves please. If not, can we set one up please. We can confirm that you do already have an account with us.